The major focus of my research is to highlight age as a core site of social inequality. I explore age relations and their intersections with gender, race, class, and other social hierarchies. Within this focus I have researched and written about retired professional African American women and about old gays and lesbians. 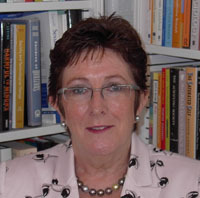 Professor Slevin has published numerous articles in a wide variety of sociology journals. Her most recent publications include three books:From Stumbling Blocks to Stepping Stones: The Life Experiences of Fifty Professional African American Women, New York University Press, 1998 (with C. Ray Wingrove); Gender, Social Inequalities, and Aging, Altimira Press, 2001 (with Toni M. Calasanti);part of the Gender Lens Series ;Age Matters: Realigning Feminist Thinking, Routledge, 2006. With her co-author Toni Calasanti, she is currently working on a second edition of Gender, Social Inequalities, and Aging.